We photographed Mana at the Christian Dada show during the S/S 2012 collections of the Japan Fashion Week. I wonder how is it to talk on the phone with that cover, not very comfortable I supose ._. @Maria: We have actually started asking people about their twitter and facebook pages. So soon you can follow the people we introduce on their own pages as well, if they have one. @Maria: Unfortunately, most of them only tweet in Japanese. When JS fans contact them in English, though they may be persuaded to start tweeting in English sometimes, too. @Maria: Cool. Amazing that you were able to find him without a link. ¿The animal in his nek is real? @Elisa: Mana is a woman, so it’s “her neck.” The fur is an authentic antique piece. 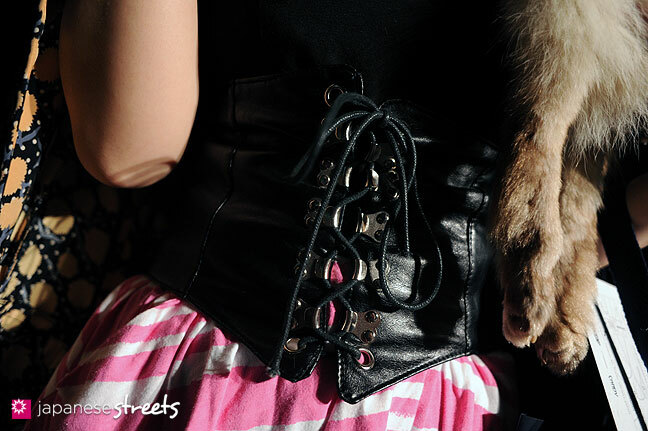 Antique and fake furs are very popular recently. So the animal it’s fake and that’s what i wanted to know, thank you. If it wasn’t fake, ask to the animal if he wants “his skin” on “her nek”. Speciesism they call it.